KPJ Damansara Specialist Hospital (DSH) is part of KPJ Healthcare Bhd, reknowned as the largest healthcare group in the Malaysian and South East Asian region. The group has 25 reputable and strategically located hospitals in Malaysia, 2 in Indonesia, 1 in Bangladesh and Thailand. It also has 1 Retirement and Aged Care facilities in Australia and 2 in Malaysia. The KPJ group also trains over 200 nurses per year via the KPJ International University College of Nursing and Health Sciences. KPJ Damansara Specialist Hospital's rich history in medical care is coupled with its expertise in Communities of Practices (COP) in the areas of Cancer Management , Renal & Dialysis Care, Sleep Disorder, Advance Laparoscopic and Diabesity (Weight Management) Centre, Paediatric Neonatal Care, Fertility and IVF Centre as well as Breast and Endocrine Surgery. 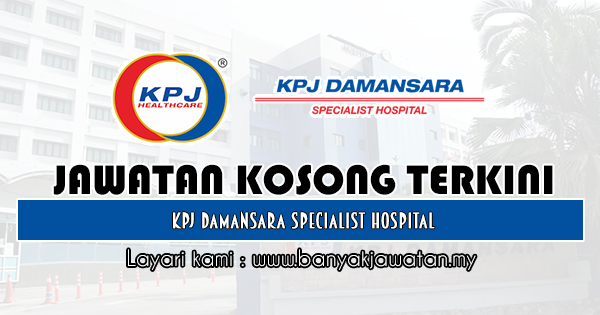 0 Response to "Jawatan Kosong di KPJ Damansara Specialist Hospital - 24 April 2019"